Designed by some of the country’s leading design and development companies led by Burke Kennedy Doyle, ARUP, Linesight & Cleary McCabe & Associates, Boland’s Quay will provide three new landmark buildings comprising approximately 36,851 square metres (approx. 397,000 sq. ft.) of office, residential, retail and cultural space. Hegarty Demolition were contracted to carry out Demolition, Piling, Excavation, Conservation and Construction Works. Demolition and removal of several in-situ concrete structures along with 3 no. substantial concrete silo structures up to 55 metres in height. Demolition of the highest structures was achieved using Hitachi 870 Ultra High Reach Demolition Machine. The structures to be demolished were surrounded by Listed Buildings being retained and Grand Canal Dock. Demolition of 75% of ‘The Factory’ building and re-construction of the original front gable wall on a new line 50 meters nearer to the docks. To accomplish this, each corner stone and all significant stones were recorded, surveyed and logged in a deconstruction sequence to allow each piece to be removed and sent for storage off site for six months before being brought back to site and re-constructed to the highest standards as specified by the Conservation Architects. Installation of 300m of secant piled wall to the perimeter of the full site together with associated supporting anchors, capping beams and temporary propping. Excavation and disposal of 45,000 cubic metres of inert and contaminated soils. The basement excavation reached a depth of 12 metres, allowing for the construction of a triple basement. Making safe of the derelict Listed Buildings to allow full survey ahead of complete strip out. 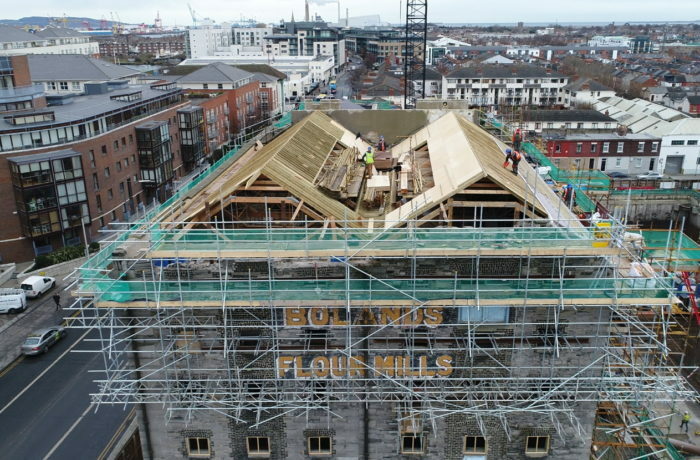 Salvage and restoration of the original roof trusses from the Listed Buildings. Pine trusses were taken out intact, removed for drying and then restored to the highest conservation criteria, before being reinstalled in their original positions. A new ‘Blue Bangor’ roof was installed to match the original, complete with cast-iron gutters and downpipes. Gables over Grand Canal Dock were taken down and rebuilt using natural lime mortar and the original limestone and bricks. A steel portal frame with concrete metal decks was constructed within 3 of the Listed Buildings. Numerous repairs to the limestone and brick structures. Reconstruction of arched openings using original materials and methods.